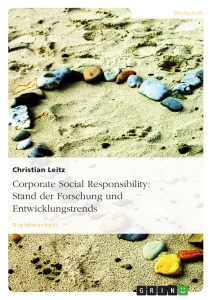 "Corporate Social Responsibility", or CSR for short, is the buzzword for company’s voluntary initiatives involving a number of various activities and company’s programs. But the question is what does Corporate Social Responsibility really means and how is it implemented in German companies? Expectations are growing as the public at large and, increasingly, the financial markets want to know not just what a company does with its profits, but also how it earns them. This assignment examines first in what extend ethical aspects are an essential condition for the justification of Corporate Social Responsibility. 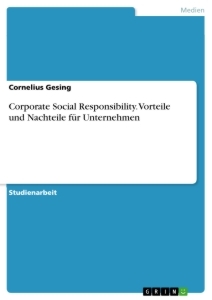 Therefore the basic aspects of CSR and the paradigms to ethics will be discussed in the first part. Afterwards before examining the situation of CSR in the German businesses landscape, the main elements to build up a program focussing on social responsibility will be listed. Then with the insight of what drives a CSR program, the question how is it implemented in German companies in order to meet stakeholders expectations will be answered. Several surveys conducted by agencies and the German ministry will be the basis for an objective reflection of the situation in Germany and illustrating the variety of initiatives and commitments. Final regards on the problems and risks connected with Corporate Social Responsibility are mentioned to close up the study. If you follow the literature and daily press, marketers are verifying their relationships with social values and responsibilities. Philip Kotler1 is pointing out in his ‘Principles of Marketing’ that “as the worldwide consumerism and environmentalism movements mature, today’s marketers are being called upon to take greater responsibility for the social and environmental impact of their actions.” Demands in corporate ethics and social responsibility have become important topics for the companies. Only few companies can ignore this demanding change, but are being forced to take action when authorities and the public are claiming. More forward-looking businesses readily accept their role and seek ways to best serve the interests of their customer and communities. They are building social responsibility and action into their company goals and with that approach, they include concerns for individual and community welfare in their daily decisions. 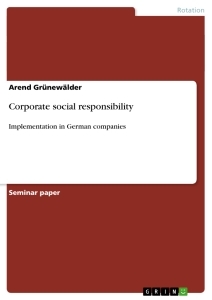 In Germany as in other countries where hot topics such as globalization, production shut downs and high CEO salaries are currently being discussed and criticized, society expects companies to demonstrate their commitment in regards to social responsibility. 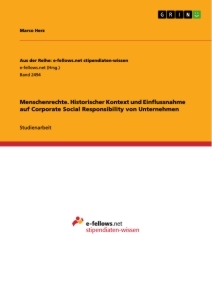 This working paper analyzes the structure and effects of Corporate Social Responsibility (CSR) and reflects the current situation of CSR implementation in German companies. Responsibility is not only anyone of those marketing tools. CSR describes rather a commitment of a company towards a social and worth living created society. That’s why CSR is not restricted to e.g. philanthropy and donations2. CSR is a long-run instrument incorporated in future-oriented company strategy to which the company benefits in terms of company and product value in a sustainable way. Therefore companies which want to implement CSR have to adjust their core-business towards the social responsibilities and have to communicate it to stakeholders. Then with an effective implementation of CSR, companies are able to increase their image and brand. 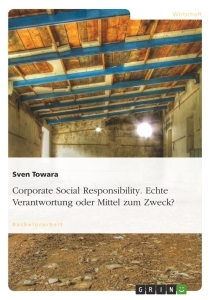 The term Corporate Responsibility was first-time introduced 1953 in the US when Bowen in his publication ‘Social Responsibilities of the Businessmen’ said that entrepreneurs have to take over responsibility in adjusting their business towards expectations, objectives and values of the society3. The idea of CSR stems from concerned companies in the end of 19th century which voluntary initiated actions4. They reacted to social abuses and the associated demands of labour movements. Those forward-looking companies at that time built homes and hospitals for the staff and their families in order to raise motivation and the efficiency. In the UK in the 80’s during the era of Thatcher government, companies started to take a closer interest in the social stability since violent und unemployed youths in larger cities created a social problem. Until today British companies pay close attention to the social needs of various different groups when considering ways to improve the living conditions and so building trust and acceptance. Environmental protection as part of the CSR scope started to emerge in the 1970s in Germany as a pressing matter of concern to society. However, the businesses began to be recognizable concerned and to respond to the society demands at the starts of the 1990s. Particular large companies began to publish voluntary environmental reports and to assess life cycle of products in an attempt to meet society’s rising expectations. During the 1990s many larger companies introduced an environmental management in accordance to the European Eco-Management and Audit System (EMAS). Soon, other to environmental tasks committed companies have become attracted by this initiative and the opportunity to sustainability as a strategy for preserving resources and protecting their future prospects. Ethics derives from the Ancient Greek, from the adjective of ethos which means customs, habit. Ethics is a major branch of philosophy and is the study of values and customs of a person or group. It covers the analysis and employment of concepts such as right and wrong, good and evil5. Today ethical charters have been introduced in many companies, the number of economic conferences dealing with ethics is increasing, more and more businesses are expressing themselves on ethics, ethical experts are being recruited to evaluate the company ethic codes and to control the policies6. But a criticism mainly suggest the idea that deontology in this area serves only to reinforce the economic and financial sphere. Corporate Citizenship (CC) describes the effort of a company with regards to all rights and responsibilities to integrate itself into the society. CC comprises the engagement for the community at its location as well as contributing towards a fund and sponsoring10. Corporate Governance (CG) addresses the organization of the management and control of a company in order to ensure an optimal balance of interests between all groups of stakeholders. Corporate Volunteering supports civic common welfare by either directly providing know how, working time or resources or by encouraging employees contribute in community initiatives Corporate sustainability (CS) encompasses strategies and practices that aim to meet the needs of stakeholders today while seeking to protect, support and enhance the human and natural resources that will be needed in the future11. According to a survey of European fond managers12, for 79 % of fund managers and analysts surveyed, the management of social and environmental risks has a positive impact on the company’s market value in the long run. 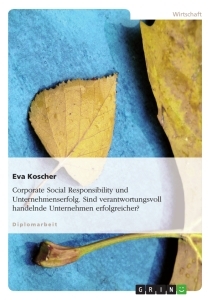 For 59% of fund managers and analysts, social and environmental crisis are an important or very important consideration when making investment decisions, indicating that CSR can become relevant in the short term when it impact’s a company reputation. Does social and environmental risks impact on a company’s long term market value? Advocates to CSR from the polical side as well as from the industry side claim that Social Repsonsibility pays off not only for the ecologial aspects but also the economic situtaion of a company. Thus suggest the European Commission that CSR contributes to goal for the European market to become until 2010 the worldwide most competitive and technological dynamic market13. And from the US company Nike it is being said “Every day we drive responsible business practices that contribute to profitable and sustainable growth”14. The clear and long-term commitment of senior management is crucial for a demanding CSR performance. Its commitment also determines how consistently the necessary company’s CSR managementis realised. 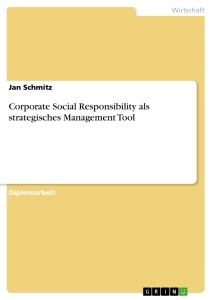 CSR can only be integrated into a company’s management processes effectively if the units concerned support the initiatives and action planned15. A CSR department should be coordinating tasks with regards to CSR throughout the company. Coordination will be most effective if a specific and assigned coordinator is nominated and responsible for all areas of the company. 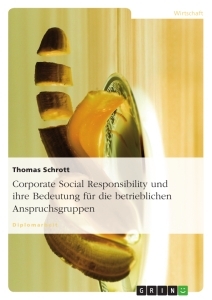 But the most reliable way to establish CSR firmly in the management of a large company is to assign overall responsibility and oversight for CSR to a single member of the board. This then provides the coordinating CSR department with direct access to the senior management and accelerate operational decision-making. 13 EU-Commission (2002), p. 3.